Delicious and easy to make, these Chicken Meatballs are a perfect dish for any occasion and any meal. They can served with a choice of sauce, inside rolls or even served as a snack/appetizer. 1. Combine all the ingredients, except oil, in a bowl. 2. Mix well until evenly combined. 3. Make small balls of this mixture and keep them on greased baking tray. 4. Drizzle some olive oil on top. 5. Place the tray into a preheated oven at 450F/225C and bake for 20 to 25 minutes or until the meatballs are cooked through. 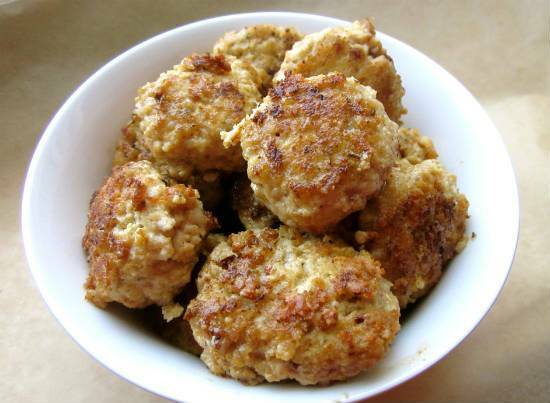 Feel free to comment or share your thoughts on this Chicken Meatballs Recipe from Awesome Cuisine.